I seem to have found a few projects that are fitting right into my third trimester pace. 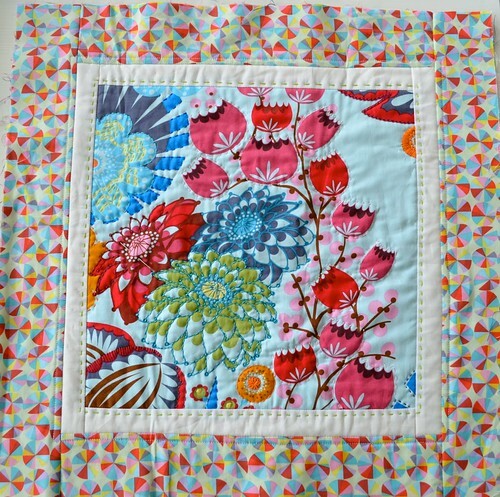 My current fave to work on is the Orbit QAL in lusciously soft voile from Anna Maria Horner's Little Folks line. 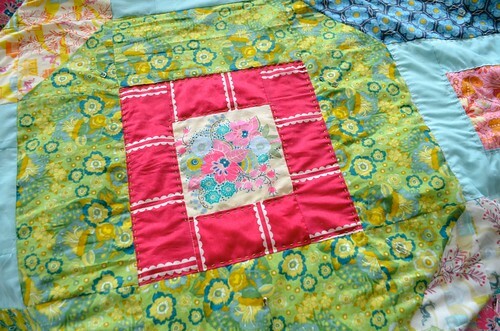 I finally pieced together a backing, log cabin style, and got it basted so I could move on to the quilting! I might go back over it with some free motion quilting in some of the larger orbits, but I think it will be a while before I have to make that decision. My next two projects are left over from Quiltcon and I am eager to get these wrapped up. I just can't decide what to work on first! This is my front pillow panel from Anna Maria Horner's Every Last Stitch class. I just need to outline a few more flowers and add another running stitch to the white border before I make it into a pillow. 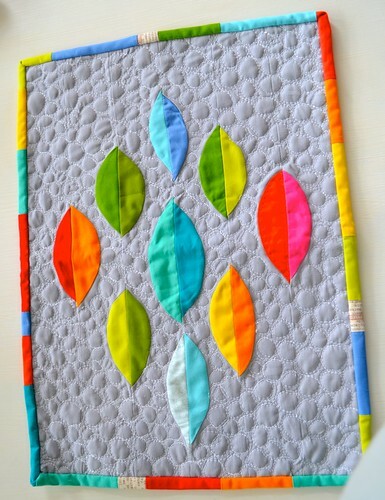 This mini quilt is from my amazing Mini Quilts class with Lizzy House. It is quilted and bound but just needs some more hand quilting love before I hang it up. Those leaves are actually all pieced, but the pebble quilting in the background made them puff up a bit and look like applique. That is my preggo belly in the bottom right corner - baby photo bomb!